Six games into the new NFL season, the contagious fanaticism of football season is upon us, from chatter at work to discussions amongst friends and family about how the teams are faring. As a devout follower of the NFL, having some means — any means — to watch the games goes without saying. Thanks to the generous folks at NBC, Sunday Night Football is just a few keystrokes away. While nothing quite tops the joy of watching a game in all its HD glory on your television, this new and free internet service offers a number of features that transcend the traditional viewing experience. If you want to review a play, you can rewind and play one back as often as you’d like. 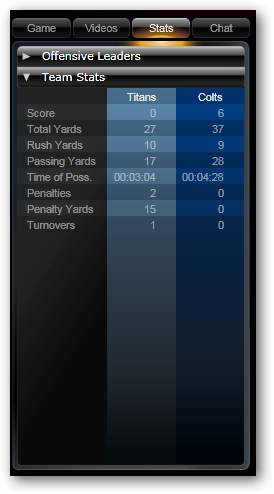 A sidebar gives an informative delineation of the statistics, by team and player. Lastly, for those who tire of constant interruptions by commercials, watching through this viewer will see far less advertisements. In fact, during those breaks, you can still view the action on the field. Matching the fun of crowding around the television with friends and food is near impossible, but this is an alternative that every fan of the sport should keep in mind — provided, of course, they have access to the internet. 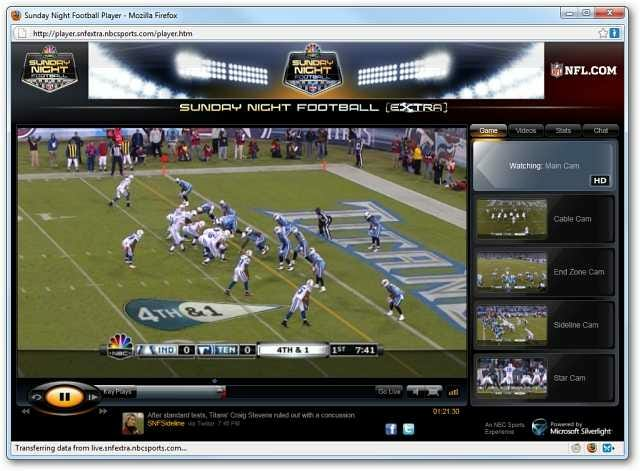 Working on on both Mac and PC platforms, you can use NBC’s Sunday Night Football player here. Omg i love the NFL i had no idea you could watch it on your pc…thanks for the great info, this is a must for me lol!